We take account of recreational activities when making decisions on releases and water level targets when operating the River Murray. A key objective at all times is to contribute to community safety as well as the economic, social, environmental and cultural activities of people using the River Murray system. However, we are required to maximise water availability for the southern Basin states and to deliver their water entitlements. This means that the supply of water for irrigation, town water supply and to the environment often takes priority when operational decisions are being considered. It also means that water cannot normally be released from a reservoir for the sole purpose of improving river levels for recreation; the water must also be needed to meet the delivery of state-held entitlements. We strive to align water deliveries with recreational needs whenever possible to keep river, weirpool and dam levels as high as practicable during peak recreational periods and at popular destinations. We take account of all known recreational events such as boating festivals and water ski races and will attempt to meet desired flows and levels whenever possible within the constraints of broader system and other priority requirements. Our river operators communicate regularly with the organisers of some of these major events and activities along the river. Operational decisions are then made to cater, as far as practicable, for these key events. 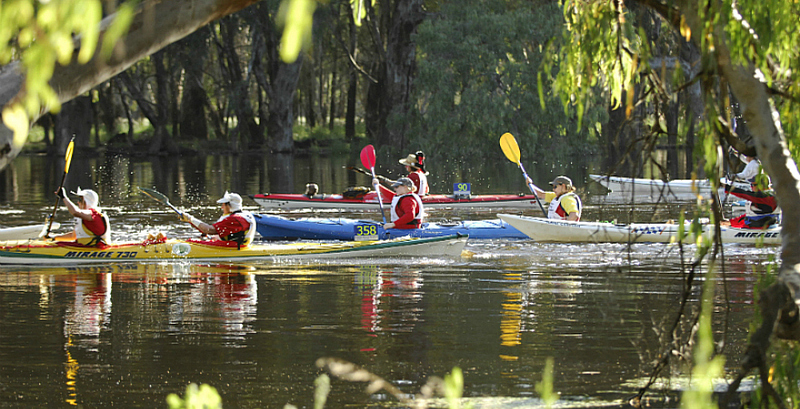 The Murray Paddle is one of the world's longest paddling races covering 404 km of the Murray over 5 days. Releases from headwater storages such as Hume Reservoir take many days and weeks to travel down the River Murray (eg. 3–4 weeks to the South Australian border). It is extremely difficult to predict weather conditions such as rainfall and temperature and their impacts upon water demands and transmission losses this far into the future. Adding to the challenge is the often competing nature of river users' requirements. For example, to maintain a weirpool at a level suitable for a ski race, it might be necessary to temporarily reduce releases from the weir making the river downstream unsuitable for boating. Alternatively, releasing water from a reservoir to meet irrigation deliveries could reduce recreational access to the reservoir. Therefore, despite our best efforts to support ongoing recreational activity across the River Murray system, it is not possible to guarantee that river and reservoir conditions will always be safe for boating or swimming. It is therefore very important to keep up to date with current and forecast river conditions and plan your activities accordingly. Scheduled asset maintenance and construction activities are vital to the ongoing safe and reliable operation of the River Murray system. These activities are scheduled to minimise impacts upon the community in general, however they will often impact upon recreation due to the possibility of significantly lower water levels and the duration of the work. During flood events or 'unregulated' high-flow periods the river behaves and flows to a much more natural pattern. At these times, extra care needs to be taken of higher river velocities, flood debris and unfamiliar snags. The river is a dynamic system with constantly moving sandbars and snags and river users should not assume that conditions for recreation will remain the same for a given flow rate or river height.